Seems lists keep getting' longer, money keeps gettin' shorter, shoppin' days fly by faster, and awesomely G R E A T gift ideas, sure to please every recipient, are almost nonexistent. Take heart, there's terrific news – at least confirmation of any rumors you may have overheard – yes it's TRUE! 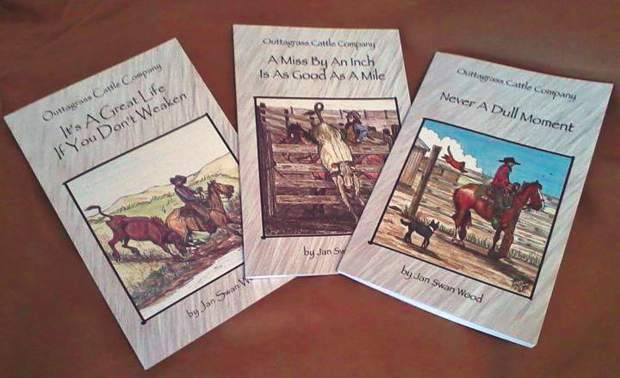 Our favorite friend, cowgirl, writer, cartoonist and columnist Jan Swan Wood has just released another of those hilarious Outtagrass Cattle Company cartoon books! 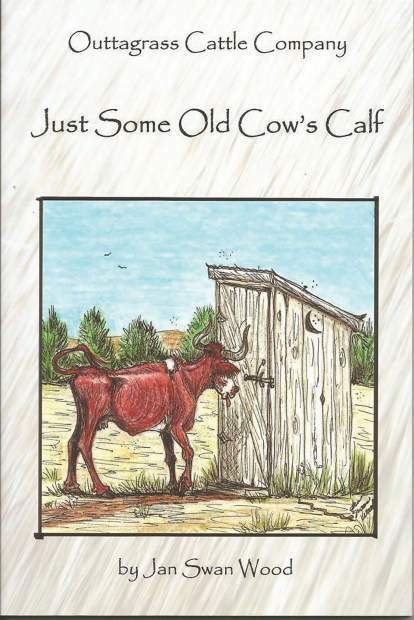 Cram-jam with 62 side-splitting captioned illustrations – a centerfold half dozen in living color – this #4 jewel of Jan's is titled "JUST SOME OLD COW'S CALF." Varnished color cover, high quality paper, size and style fit the first three like a glove; and Jan's dedicated this one to the cattle buyers she came to know and cherish across the years of accompanying her Dad to sales. As always, she'll autograph each book per your instructions an' ship 'em to you in plenty of time for gifting. In a world of inflation this cowgirl's still pricing these jewels at $15 each; with a deal for those who'd like to start some special person off with the set including IT'S A GREAT LIFE IF YOU DON'T WEAKEN, A MISS BY AN INCH IS AS GOOD AS A MILE, and NEVER A DULL MOMENT along with JUST SOME OLD COW'S CALF. No bunkhouse, cow camp, or respectable Westerner's mansion should house a bookshelf bereft of these rangeland treasures. Mentioning Jan's qualifications here is preachin' to the choir…but just in case you're new to the territory she's ranch bred and born and has followed cantankerous cows through rough country on rank horses long enough for her hair to turn gray (amply assisted by the sheep she's worked). Somewhere amid being a working rancher, wife, mother, active churchwoman and doting grandmother Jan somewhere found the time to become a fine artist and Western wordsmith known for excellence in reporting and quality cowboy poetry…oh, did I mention she's good with windmills an' water gaps and also sings like an angel? Fine as those talents are, Jan's quirky, twisted, overactive sense of humor beats 'em all in spades, and her cartoon books share the joy with the rest of the world. Christmas is bearing down on us…spread some JOY TO THE WORLD by gettin' your orders in today – Jan Swan Wood, 13340 Hope Road, Newell, SD 57760; teakwoodike@yahoo.com; or 605-456-2559.